If you are usually greeted by the sun, try to greet the sun at all times. While on vacation to Bali, Sanur beach is one of the beach is right to see the sunrise. With its location in the east of Bali, Sanur beach so it is appropriate that the perfect place to enjoy a beautiful sunrise. 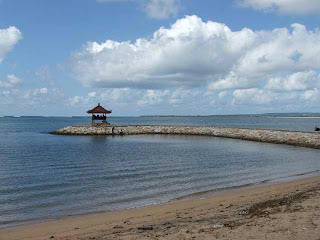 If you want to feel the beauty of the island in the morning, choose lodging in Sanur beach area. 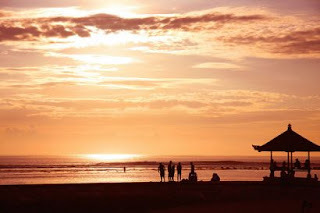 The beach is not too far away from the Ngurah Rai Airport, just 20 minutes by car. Exit the room when at around 5:00 pm, before the other tourists wake up from sleep. Head to the coast is still dark. Although still tend to cool the air, the sound waves and the friction of leaves in the wind will wash away your feelings. Not too long to wait, quietly issued a tinge of sky light. Originally purple, gradually become orange. When I was a purple-colored, natural silence would be broken by the sound of birds began foraging. Soon, the sun will rise and warm the earth. The process of rising sun was not long, even fairly short. In just 10 minutes, the sky was already dark in the morning sun illuminated. But do not worry, you can still enjoy the peace at least until around 6:00 pm. Once satisfied with the atmosphere of the morning chatting to the east of Bali, now prepare yourself to enjoy the Sanur Beach area during the day and evening. This coastal area is known as a center of games and water sports. You can play parasailing, banana boat and canoeing here. If you're a surfer, surfing here is also one of the activities that should not be missed. Sanur beach beautiful waves too dear if only viewed it. Prepare your best surfboard and spent time playing with the waves. For those of you who just want to relax on the beach, Sanur will not disappoint. And soft white sand, blue water is too clean. Not far from there, many shops and restaurants that could be the first recourse when hunger and thirst strikes.